After lunch we visited another hotel just outside the city centre called the Terma Linca for our deluxe hotel category. This is a lovely hotel resting by the river below the road and town above. It almost feels like a rural retreat of peace and tranquillity. The trees were still bare and the river was lying low as it was still February but in the spring and the summer, I was told by the hotel manager, the trees would be in blossom and covered in green leaves and the river will be rising enough for boating and other activities etc. The view from the hotel to the other side of the river is of trees and hills. The hotel also has a small area of white sandy beach for summer sunbathers. 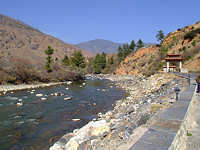 In front of the sandy beach there is a beautiful pond for sitting and relaxing in the spa and treatment facility including the famous Bhutanese hot stone bath. The hotel has been built with traditional stone walls with long wooden windows. The rooms are large and luxuriously decorated and laid out with wooden furniture, wooden floors and wooden wall panelling with large windows looking out on to the river. All rooms and also the restaurant and bar are built with windows to overlook the river. The view from the other side of the hotel which can be seen from the long corridor windows is of working rice paddies. While we were there an ox in the field was pushing its nose toward the window. This is a luxury retreat in the countryside. This afternoon we also inspected a second deluxe hotel, the Taj Tashi hotel. This is a member of the Taj Hotels chain, as is the Taj Mahal Hotel in Mumbai, India. 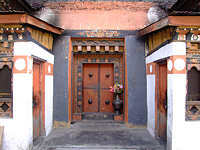 This hotel is right in the centre of Thimpu. 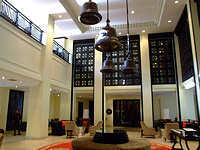 The entrance to the hotel lobby and the lobby itself are beautifully decorated with 4 huge bells dangling from the high ceiling. The elegant dining area is below, downstairs from the lobby and there is a wonderful overview of the restaurant from the lobby above. The hotel is large, and beautifully decorated throughout including the guest rooms. There is also an indoor swimming pool, gym and spa. This is a luxury city hotel. We returned to our hotel for dinner. Tonight was unusually noisy and busy in Thimpu as we arrived during a 3-day public holiday in celebration of the King of Bhutan's 30th birthday. Next morning we visited the beautiful and imposing Trashi Chhoe Dzong, a whitewashed tall building with 3-storied towers topped by the red and gold triple tiled roofs. This 'Dzong' (fort) houses offices of government, along with a monastery, the summer home of the Chief Abbott and the Monk Body. The vast courtyard is the most attractive place to admire the splendid architecture of the buildings. 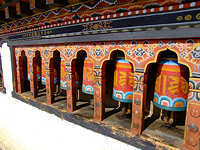 Like all monasteries in Bhutan there are sets of prayer wheels built into the walls of the corridors. If you want to turn the wheels always remember to turn them clockwise and never anti-clockwise. 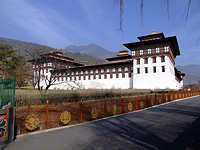 Across the river from Trashi Chhoe Dzong is the National Assembly building and beutifully situated next to the river is the King's palace. Later we visited the Changangkha Lhakhang, a small, old temple and monastery school for monks as young as 5 years old on the hill just outside the city centre. We drove a little further up the hill to enjoy the spectacular view of the Thimpu valley. 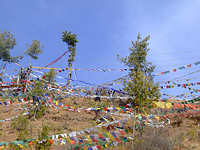 All the way we saw the 5-coloured prayer flags (blue, red, yellow, green and white) tied to the trees forming a colourful sign of good luck and good wishes. This is seen everywhere we go in the next few days on our trip around the country. It is a very reassuring thing to see whiletravelling. After a local lunch of dumplings and Druk beer we visited the Memorial Chorten in town built in 1974 in loving memory of His late Majesty, King Jigme Dorji Wangchuck. 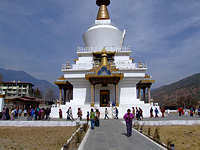 This white Stupa with its golden finial is the most visited religious structure in Thimpu. Local people come here to spend the day in prayer and circling the Chorten, turning the large prayer wheels and praying for the whole day. We joined in with those already walking clockwise round and round the Chorten, We left after one to two rounds but the local people continued probably for the rest of the day. We visited the little chapel of Zangto Pelri Lhakhang and also the oldest temple, Dechen Phodrang. The local people take their young children to this temple to be blessed against illness. I saw a couple with their young child walking up the steps to the temple as we were coming down. Our guide also told us that all his children had been blessed by the monk in this temple. 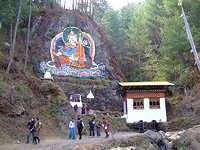 Spiritual and religious belief remains very strong in Bhutan's traditional culture. We might have lost it in the outside world but Bhutan remains pure and spiritual. Our guide suggested to us a trip to see Cheri Goemba, a monastery about one hour's hike up to the top of a hill. We did not do it as we did not have enough time on that day, but it would have been a nice walk with the view of the lovely valley and river below. On the way here, we also saw a beautiful rock painting of Buddha with a water-powered prayer wheel by the road side and an altar in front of the rock for worshippers. We returned to hotel in the late afternoon and enjoyed a very good dinner at the hotel especially the local stewed chicken dish. Next morning we left Thimpu to drive to Punakha.